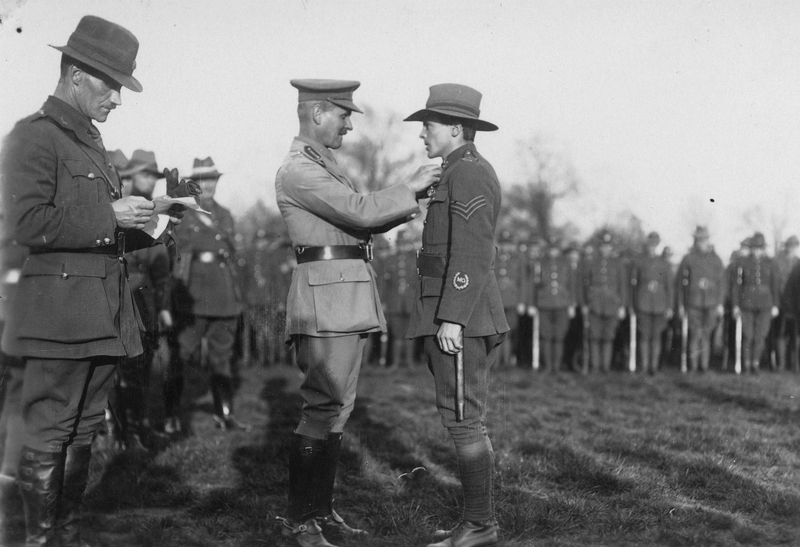 Lieutenant-General Sir William Birdwood presenting Sergeant Frederick Watson with the Distinguished Conduct Medal for bravery at Gallipoli. Alexander Turnbull Library, PACOLL-10121-002. During the First World War New Zealand soldiers were eligible for bravery awards through the British gallantry awards system. At the pinnacle of this system was the Victoria Cross (VC), which had been created 60 years earlier and was the first British gallantry award to be available to all military personnel, regardless of rank. By the outbreak of the war, however, several other bravery medals had been developed and additional medals were instituted during the war itself. Next in status after the VC were the Distinguished Service Order (DSO) for officers and the Distinguished Conduct Medal (DCM) for soldiers. The DCM was mostly given as a bravery medal but the DSO for officers could either be for bravery or for superior leadership and by 1915 tended to be reserved for senior officers. The next two awards in the hierarchy were the Military Cross (MC) for junior officers and the Military Medal (MM) for soldiers. Lieutenants, Captains and Warrant Officers could get the MC for bravery or leadership. Soldiers up to Sergeant could be given a MM. Any soldier specifically written about by the senior commanders in their official reports, but who didn’t get a medal, was given an emblem to wear that showed they had been ‘mentioned in dispatches’ (mid). In total 476 of the gallantry awards mentioned above, ranging from a single VC to 321 mids, were awarded to New Zealanders as a result of their actions during the Gallipoli campaign, or to less than 3% of the approximately 17,000 New Zealanders estimated to have served on the peninsula. While there is no question that those who received these awards truly merited them, it was commonly felt by those who had participated in the campaign that the quantity of bravery awards was an unfair representation of scale of the bravery they had witnessed. As Cyril Bassett, the sole New Zealand VC recipient at Gallipoli later recalled, “When I got the medal I was disappointed to find that I was the only New Zealander to get one at Gallipoli, because hundreds of Victoria Crosses should have been awarded there. All my mate ever got was a wooden cross”. An examination of how the bravery award system was administered shows that it was inevitably something of a lottery. To be eligible for an award a soldier not only had to carry out a signal act of gallantry but to have been seen to do so by someone in authority. This was no guarantee, however, that an award would necessarily follow. As Major William Cunningham later explained, “Many gallant acts were performed and of many there can be no record. Too often actor and spectator died and no more is known”. Survival or otherwise also affected which medals could be awarded. As the VC was only gallantry medal that could be awarded to someone who had been killed while carrying out their deed, many of the brave acts by those who did not survive could only be recognised with an mid. Attitudes within the chain of command also had a major effect on both the quantity and quality of the bravery decorations that were awarded. Major General Sir Alexander Godley, the New Zealand Expeditionary Force commander, for example, believed that officers should not be eligible for the VC as by behaving gallantly they were simply carrying out their duty. There was also a widespread if largely unspoken belief that troops who had been unsuccessful in an attack should have recognition of their gallantry reduced. Senior commanders also had to be mindful of the number of awards being made in other theatres of war and to the various national contingents. The overall result was that medallic recognition for bravery remained rare, but it is also the case that the high command worked to ensure that this continued to be the case.